Turn an Akai APC40 hardware controller into a Kyma Virtual Control Surface. vKA delivers most of the features of the VCS in an intuitive, easy to use manner. 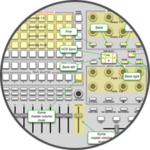 Since the APC40 was designed as a control surface for Ableton Live, vKA allows use of the APC40 with Ableton Live even while controlling a Kyma sound. vKA has special “smarts” to alternate between “Live mode” and “VCS mode” without missing a beat. vKA with the APC40 may well be the best option if you like to use Kyma on stage. * Provides a “virtual MIDI port” when used with the Paca(rana) and “MIDI-over-OSC”, giving MIDI applications direct communication with the Paca(rana) without additional MIDI or USB interfaces. vKA can be purchased from the Delora website, www.delora.com/sales/ for $32.95 USD.